The introduction of a much more family friendly fiesta in 2016 is reaping major rewards for the City Council of Pamplona with data collected from the 2018 event showed yet another year of increases in the number of people involved in the arts and activities program with more than 1.5million attending the event. As the city itself has a population of under 200,000 inhabitants this is good news for the local economy and the 2019 event is expected to once again experience growth. 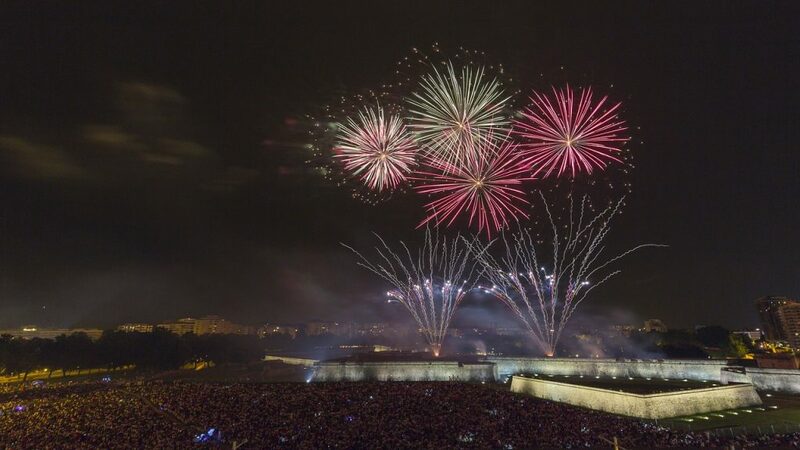 The largest attendances were again recorded at the massive nightly fireworks displays with an estimated 434,000 people witnessing the pyrotechnics and also at the Giants and Big Heads of Pamplona staging’s (the Comparsa de Gigantes y Cabezudos) where more than 190,000 witnessed these massive cardboard and paper mache statues, dance, walk, twirl and party in the streets of Pamplona. There are so many vibrant, exciting and participatory events at San Fermin nowadays proving it is way beyond participants remembering the event just for the Running of the Bulls. The municipal campaign to raise awareness among all citizens and visitors to San Fermines in Pamplona has been based on a more modern event with increased artistic and cultural events, a fiesta free from sexist aggressions and crime and to instil a more “green” basis to the entire fiesta with waste reduction and recycling programs at the forefront. There was, in 2018, 490 Official Acts on the Municipal Program of San Fermines and in 2019 there are expected to be even more than this. Naturally it would be impossible for anyone to attend all these events and just keeping up with where all these events are located and when they are on would prove to be a titanic task for any experienced festival goer. Fortunately the City Council of Pamplona have made this task much easier with the recent introduction of an Official App for the event available on both android and iOS and downloadable in Spanish, Basque, English and French. The events program Check when and where events are taking place. Giants and Big-heads. Locate the position of the “Comparsa” in real time. What to do now? Get information on active and forthcoming events. The “Encierro”. Do you intend to run the bulls? Get information on the track and be aware of the regulations and recommendations for runners. To ensure your full enjoyment in Pamplona for the Festival of San Fermin and The Running of the Bulls this new App is highly recommended. There are many places offering San Fermin Accommodation and a number of fantastic tour companies that operate Pamplona Tours during San Fermin. If you’re planning on heading to San Fermin this year think about downloading the awesome Official App of the City Council of Pamplona from the Google Play Store or The Apple Store. The post Pamplona’s San Fermin – More than just a Bull Run… appeared first on FeedsPortal.com.